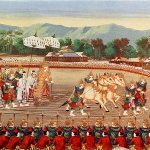 The Royal Ploughing Ceremony is an ancient rite that marks the beginning of the rice growing season in many Asian countries. In Cambodia it is celebrated on the 4th day of the 6th lunar month's waning moon. It is one of the country's public holidays. The ceremony has a dual origin – Hindu and Buddhist. At some point in history, two similar ceremonies merged into a single one. During the ceremony, two sacred oxen are hitched to a plough. Then the oxen plough a furrow in a ceremonial rice field, while priests sow rice. Afterward, the oxen are relieved of their harnesses and offered a variety of foods: rice, sesame seeds, corn, fresh-cut grass, beans, water and wine. Cambodian farmers predict the weather, farming conditions and harvest depending on what the royal oxen choose to it. Many of them believe these predictions to be true. In Cambodia, the ceremony takes place in the large park next to next to the Royal Palace and in front of the National Museum. It is typically overseen by the monarch and the Prime Minister. Sometimes the King himself chooses to take part and actually guide the plough. The ceremony is attended by citizens clad in traditional Khmer costume. On the occasion, agricultural exhibition are also held.